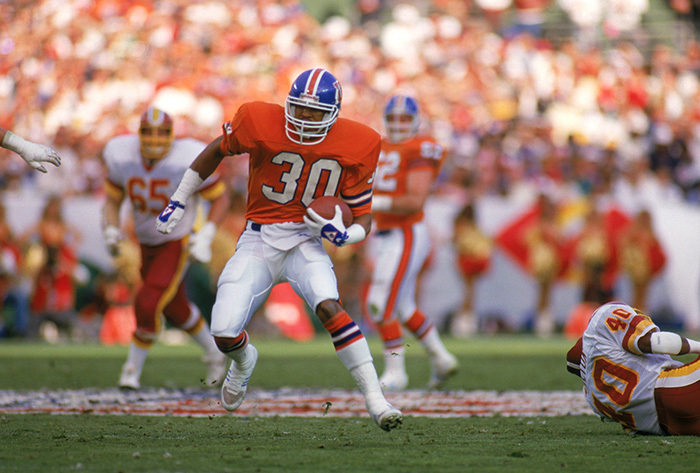 On Jan. 31, 1988, Williams directed the greatest offensive performance during a single quarter in NFL postseason history, throwing four touchdown passes as part of a 35-point, 356-yard second quarter in the Washington Redskins’ 42-10 victory over the Denver Broncos in Super Bowl XXII. He became the first African-American passer to both start in a Super Bowl and be selected the game’s MVP. And Williams also became a hero to black America. That day in San Diego, with the weight of an entire race on his shoulders, Williams stood on the game’s biggest stage and displayed the skill, intellect and heart that black signal-callers supposedly lacked. Even now, 30 years later, discussing the groundbreaking moment stirs pride in Williams. “There’s not a day that goes by that I don’t” think about it, Williams said recently. “Not for what it meant to Doug Williams but because it was about much more than Doug Williams. It meant a lot to a whole lot of other people. All the political angles, what people would say depending on what I did, I knew all of that going into the game. But I tried not to put myself above the team and make it all about Doug Williams. In the second quarter, Williams went 9-for-11. He passed for 228 yards and the four touchdowns. Overall, he completed 18 of 29 passes for 340 yards with one interception. Wide receiver Ricky Sanders (four receptions for 168 yards and two touchdowns in the second quarter) and rookie running back Timmy Smith (five rushes for 122 yards and one touchdown) also made indelible marks during the Redskins’ stunning 15-minute run. Williams, however, was the story. The bond that Williams still shares with former Redskins head coach Joe Gibbs provided the foundation for his historic achievement. Gibbs’ decision to bench quarterback Jay Schroeder before the playoffs and elevate Williams, the team’s backup for two seasons, set everything into motion. Going back even further, it was Gibbs who helped pave the way for Williams to become the first African-American QB picked in the first round of the draft post-merger. It was only fitting that Gibbs coached Williams as he broke through one of professional sports’ toughest barriers. “Obviously, what he did that day … Doug really played great,” Gibbs said. “Our offense played great and our defense played great. Our defense doesn’t get enough credit for what it did, and I’ve always felt badly about that. We spoke with many key participants on both sides in the 1988 Super Bowl. 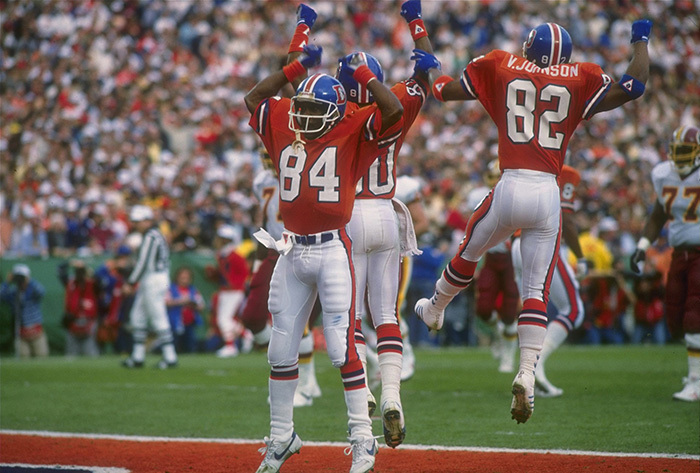 Not surprisingly, the Broncos weren’t as eager as the Redskins to take a trip to the past. Decades later, what occurred in the game, and during the second quarter in particular, is still too painful for some former players to discuss. All those interviewed, however, expressed admiration for how Williams produced under an intense spotlight, and they credited him with opening doors for others. Everyone quoted is identified by the titles they held during the 1988 Super Bowl. After being drafted 17th overall in 1978 by the Tampa Bay Buccaneers, Williams helped that team reach the playoffs three times in four years. Frustrated about being one of the NFL’s lowest-paid QBs, Williams bolted to the USFL’s Oklahoma / Arizona Outlaws. He played in the USFL for two seasons until the league folded, and then returned to the NFL as a backup to Washington Redskins starter Jay Schroeder. Williams signed with the Redskins largely because of his relationship with Gibbs, who was Tampa Bay’s running backs coach during Williams’ rookie season. Throughout Williams’ career, Gibbs had been among his biggest supporters. I get this phone call from Coach Gibbs. He was the only guy who called me Douglas. ‘Douglas, it’s Coach Gibbs,” he said. ‘How you doing?” He asked me to come to Washington to be a backup. Now at this point, I don’t have a job. I told him, ‘Coach, I can be any type of ‘up’ you want me to be.’ He started laughing. He said, ‘OK. [Washington general manager] Bobby Beathard is going to give you a call.’ Bobby called. We agreed [to terms]. When I was at Tampa, coach [John] McKay told me we needed to find out everything we could about this quarterback at Grambling. He sent me there to spend some time with Doug. I got to know him a little. I told Coach McKay that Doug is a great person and he’s really football smart. And gosh, he could throw the football. We took him in the first round. A black quarterback had never been taken in the first round [in the NFL]. My rookie year, Coach Gibbs came by the hotel and picked me up every night to go over to his house. We’d go over the playbook and I’d eat dinner with his family. Every night. The relationship started in ’78, and that relationship is still the same today. You could tell how much Doug respected Coach Gibbs. We all respected Coach Gibbs. He was, well, Coach Gibbs. But he and Doug went way back. Doug definitely appreciated everything Coach Gibbs did for him after the USFL. I owed Coach a lot for giving me the opportunity with the Redskins, but I only attempted one pass the whole  season. A competitor always wants to play. I didn’t want to spend another whole season sitting. So when I got off the plane after our final preseason game and Coach Gibbs pulled me off to the side, I didn’t know what he was going to say. He told me they traded me to the [Los Angeles] Raiders, who had tried to get me when I was in Tampa. I was ready to go. I packed up my apartment. I called everyone back home [in Zachary, Louisiana] to tell them: I’m headed to the Raiders. 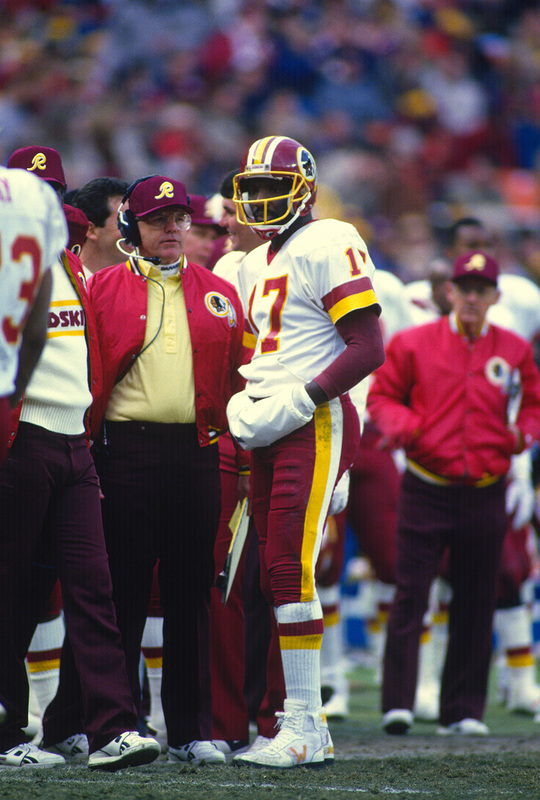 Doug Williams talks with head coach Joe Gibbs during a break in the action against the Minnesota Vikings during the NFL/NFC Championship game Jan. 17, 1988, at RFK Stadium in Washington, D.C.
That first year, everyone knew that Doug was good enough to play and win. No one ever doubted that. Each day in practice, you could see it. I tell everyone I know that watching Doug that first year [in practice], I had never been around anyone who threw a prettier deep ball. You don’t trade someone like that. Yeah … I changed my mind. I thought about it, and I just didn’t think that [trading Williams] was best for the Redskins. And I had to do what was best for the Redskins. I know that was kind of a tough deal. But I had a feeling that during the season, Doug was going to get his chance. I really believed that. I really believed he would do a lot for our team. Jay had a great year in ’86. He was the concrete starter, and then they [renegotiated] his contract. All of a sudden, it went from ‘we’ to ‘me.’ It was pretty apparent to most of the guys on the team that the whole team concept had gone off course with him. Not many teammates had a lot of respect for Jay at that time. We had such a close team. Everyone was together. Doug was such a big part of that. Everyone was behind Doug. Doug was excited. He thought he had a chance to go to the Raiders and start. That’s what he wanted. That would have been bad for us. Jay was different [after he signed a new contract]. Everybody on the team really respected Doug. Doug was all about our team. Everybody would tell you that. 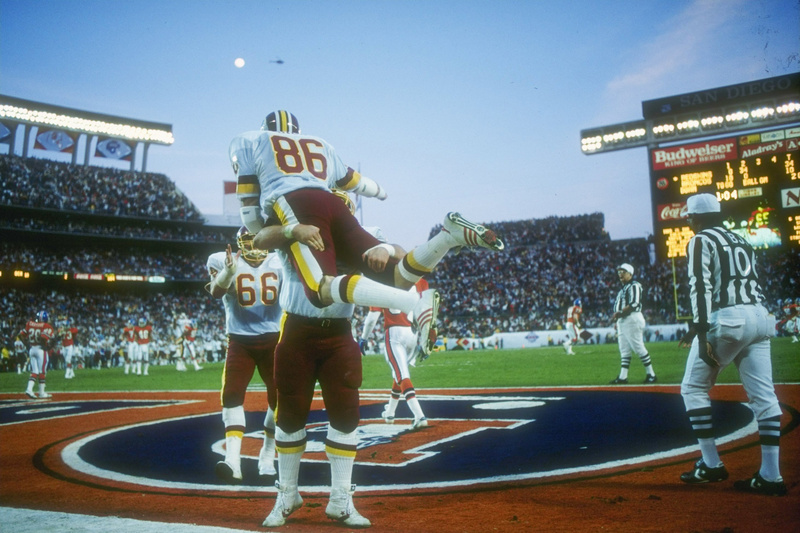 In the strike-shortened 1987 season, the Redskins went 11-4 and finished atop the NFC East. Beginning in the playoffs, Williams, who thrived off the bench while playing in five games, supplanted Schroeder as Washington’s starter. Washington defeated the Chicago Bears in the NFC divisional round and the Minnesota Vikings in the NFC Championship Game. The AFC champion Denver Broncos were making their second consecutive appearance in the Super Bowl. The previous year, the Broncos were routed 39-20 by the New York Giants. The Broncos were led by quarterback John Elway, the 1987 Associated Press NFL MVP. Against the Broncos, the Redskins fell behind 10-0 in the first quarter. 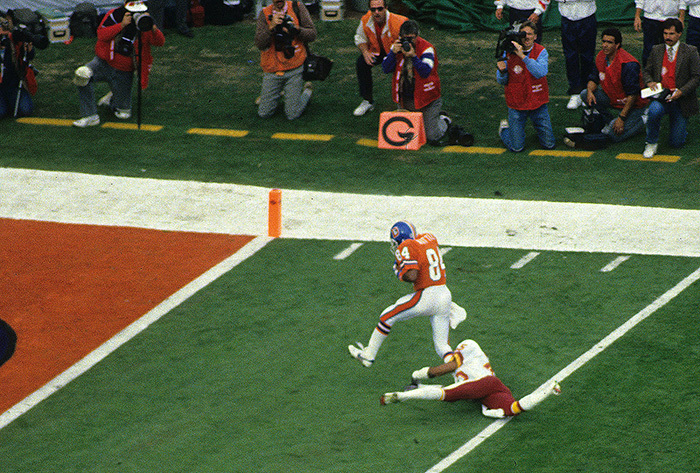 On Denver’s first play from scrimmage, Elway connected with wide receiver Ricky Nattiel for a 56-yard touchdown. The thing is, we jumped up, 10-0. So we’re right in the middle of it. We’re right there. It’s early, yeah, but you feel good about what you’re doing. You feel good about the start. Obviously, you’re feeling good because you’ve gotten on them early. That’s exactly what you want. You’ll take that all the time. You’re always aware enough to know that you’re going to have to play well for 60 minutes. You know you have to play your best football. But you’ll take that start. The part that most people don’t know was that the Saturday before the game, I had emergency root canal surgery. I was in there for four hours. I couldn’t practice at all. Then late in that first quarter, I just slipped. That turf had been sodded, and it was slippery. When my right foot hit, it just kept moving. I turned and hyperextended my knee. We had great practices that week. We felt good about what we wanted to do. Then we’re down, 10-0. Doug goes out of the game. There was just a lot going on. That whole first quarter, everyone is frustrated. Guys are coming off the field screaming. On the sideline, we’ve got all kind of stuff happening. I wasn’t happy. I’m thinking I’m going to go in there at halftime and really just … I had a lot I was going to say. Then the quarter changes. Down 10-0 to start the second quarter, Gibbs did what Gibbs did best – he made adjustments. He dialed up the Redskins’ favorite play to begin the comeback. Coach Gibbs came over and says to the offensive line, ‘Tell me specifically what they’re doing up front.’ During that era, Denver was basically a 3-4 defense, much like the [New York] Giants. But they came out running a defense they hadn’t showed all year long. They were basically running a 46 defense and running stunts inside. It was giving us problems. He puts his finger on the side of his face and thinks for maybe five seconds. And that’s when you saw the brilliance of Joe Gibbs. The worst thing anybody could do with Coach Gibbs was to give him two weeks to put a game plan together. If you give Joe Gibbs that amount of time, I can promise you he’s going to have everything covered. But he was also at the top of the list of coaches who could make adjustments during the game. Coach Gibbs would just see things that other coaches didn’t even think about. Coach Gibbs knew exactly what we needed to do. He told Doug and the offensive line what we had to run in the second quarter. The whole time I was there with the Redskins, Charlie 10 hitch was our favorite play. It was just a 5-yard hitch by the outside receivers. Of course, when you had Ricky Sanders, Gary Clark and Art Monk, you throw a hitch to ’em with the corners off, they’re gonna average 9 yards per attempt. That’s about what we averaged. The adjustment was, [the defense] could take that away by coming up and pressing you, having a single-high safety or two-deep [safeties]. In our system, if the cornerback is pressing, with no help, meaning it wasn’t Cover 2, and the safety wasn’t in the middle of the field, we always believed in one thing: With Gary Clark, Art Monk and Ricky Sanders, we were going to win that battle. We get the ball for the first time [in the second quarter]. We’re on our 20. Doug looked at me and gave me a nod. I knew what that meant. I get up over the ball and look out to my right. Ricky Sanders is pressed. I knew what that meant. Haynes tried to put his hand on Ricky. Ricky dodged him and he was up the sideline. [Broncos free safety] Tony Lilly was not going to catch Ricky Sanders. It was single-high. I know Doug’s eyes got big when he saw it too. The safety didn’t get over in enough time to make the play. Doug threw a perfect ball, and 80 yards later I was in the end zone. It was the highlight of my life. Like I said, nothing that happened in that first quarter affected me or us in any type of catastrophic way. Once we shook off that first touchdown, we knew the game would go the way we anticipated it would go. Doug and Ricky got it started. Once we scored, you knew. But obviously, no one could have had any idea about what was coming next. Sanders’ 80-yard touchdown, only 43 seconds into the second quarter, energized the Redskins. In their next 17 plays in the quarter, the Redskins would score four more touchdowns to all but end the game by halftime. Gary ran a post-corner route. Gary Clark versus [Broncos cornerback] Steve Wilson one-on-one? I’m taking Gary. On that play, Ricky [Sanders] is crossing the field. The key on that is if the safety runs with Ricky, then you’re waiting to look for the post [route] because you know you’ve got one whole side of the field to work. They played man-to-man, and we caught that thing going across the field. Gary was open all the way. He ran a great route, and then Doug hit him perfectly. Man, it doesn’t get any better than that. [Running back] Kelvin Bryant was wide-open in the flat. He never lets me forget that. We were at [Redskins] homecoming last year. Kelvin comes up to me and says, ‘I’m still mad you didn’t throw that ball to me.’ Gary gave Wilson a post move and there was no one out there. Gary was wide-open. You have to take that shot. We lost the lead quickly. It went from 10-0 to [14-10] and then on from there. We were also up against the Giants at halftime, 10-9, and that lead evaporated. But at that point, you’re not thinking about that [last year’s Super Bowl loss]. You’re just focused on the game you’re playing right then. When it was 10-0, nothing was said collectively. However, individually, I believe experience taught that much time remained in the game and we needed to increase intensity. When the score suddenly shifted, the defensive captain [safety Dennis Smith] reminded us that we, as a unit, needed to cause turnovers to give the offense as many chances as possible to score points. They were doing a really good job of isolating their receivers on our defensive backs. Credit to Joe Gibbs and his staff. It was clear they had a great game plan. But it was still a game. At that point. 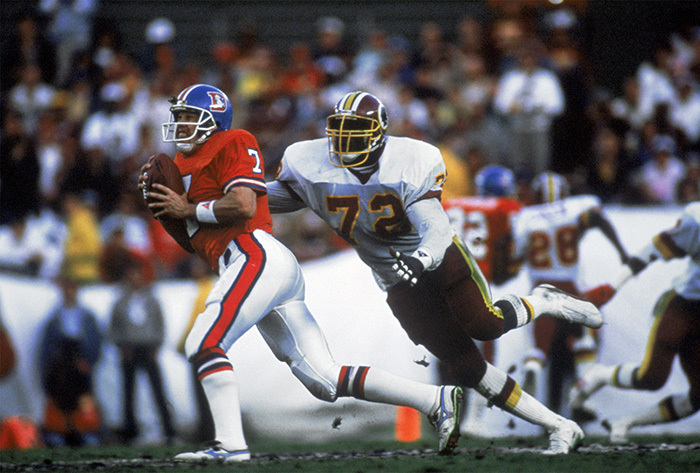 Doug Williams looks to pass against the Denver Broncos during Super Bowl XXII Jan. 31, 1988, at Jack Murphy Stadium in San Diego, California. The Redskins won the Super Bowl 42-10. Timmy Smith was another great story in that game. Timmy had great physical potential. He was just somebody who was hard to get through to. He played really great that game. And that was about it. Timmy had a lot of ability. He showed it all that game. And Coach Gibbs was right to wait to tell him he was gonna start. He didn’t need a lot of time to think about it. As soon as I heard I was starting, my mind just went blank. I couldn’t remember anything. As far as knowing the plays and all that, I forgot everything. Everything. Timmy looked up to Doug. He listened to Doug, especially when Doug kind of read him the Riot Act. Doug came over, grabbed me by my jersey and said, ‘I’ve been playing this game for nine years and I’m not going to let you f— it up for us.’ Right then, the plays started coming back to me. I was ready. On the touchdown, [Redskins left tackle] Joe Jacoby and [left guard] Raleigh McKenzie came around there and it was like a big gate opened up. The rest of it was Timmy Smith outrunning [Broncos safety] Tony Lilly down the sideline. You’ve got to understand that we had The Hogs. They were a very experienced line. And you’ve got to give The Hogs a lot of credit because they put on a show. All I had to do was run. Anytime you can run 10, 15 yards and not get touched, man, the line is doing something. Because we were running the ball so well, [Broncos safety] Tony Lilly bit on the play-action. Ricky came across the formation. We had the fake [handoff] to the right. Lilly made one step up, and Ricky went up and cross corner to end up behind him. On my second [touchdown], I actually ran the wrong route. I was supposed to run the low cross route. But I was so hyped up, I ran the deep post. Gary saw what I was doing and he knew he had to change his route. Gary is a good friend of mine, but whenever I see him he talks bad about me. He says I stole one of his touchdowns. It seemed like Doug and [coach Joe Gibbs] saw a weakness in our secondary. They saw something in our coverage of their receivers that they liked. Doug took advantage of our secondary, as he should have. That’s the biggest game of your career. You want to play your best. It was a play that was put in for that game. They called a timeout and they were going to change the play. The coaches and quarterbacks are huddled on the sideline, and [backup quarterback] Jay Schroeder lobbied to keep the play in. It was a three-receiver set. And it was a good play. But all of the plays Coach Gibbs called that day were great plays. They kept it in. I ran it, and the rest was history. It was our last one of the quarter. The whole thing was incredible. Leading by 25 points to start the third quarter, the Redskins eased off the accelerator. They scored only once more, on Smith’s 4-yard touchdown run early in the fourth quarter. Defensively, the Redskins continued to dominate the Broncos, holding them scoreless for the game’s final three quarters. But as the Redskins waited for time to expire so they could claim their prize, Williams remained in the spotlight. The score could have been a lot worse, but you saw sportsmanship at its best from a coach. Coach Gibbs was being respectful to [Denver Broncos head coach] Dan Reeves. Coach Gibbs was a gentleman. Dan Reeves was gentleman. When you have two men like that, you don’t try to embarrass the other man. 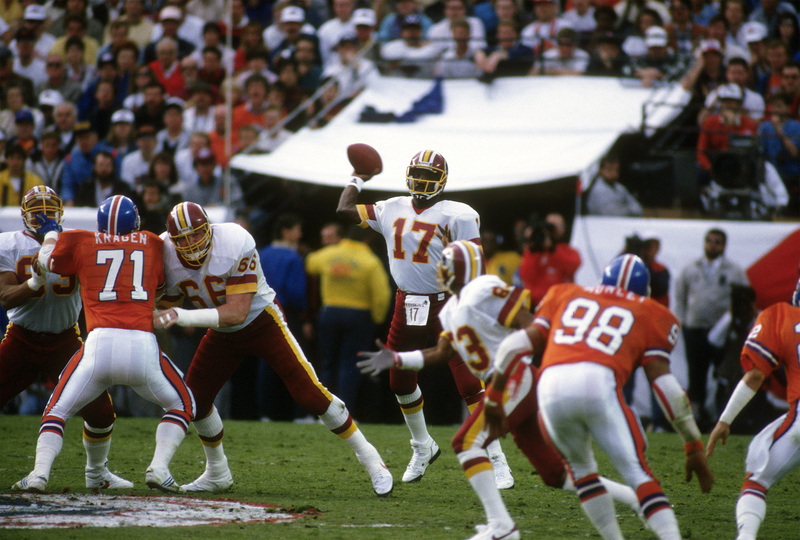 There was no better feeling for anybody on that team than the feelings we all had for Doug Williams. We all knew what he had been through. The whole thing with his contract in Tampa, the USFL folding … and coming to Washington as a backup. Then he’s the first black quarterback to start a Super Bowl and he gets hurt and has to come out. But he came back and showed what he’s all about. You knew Doug wasn’t going to run from anybody. The whole thing about being the first black quarterback to start a Super Bowl, some guys couldn’t have handled that pressure. But not Doug. Doug is going to stand right there in that pocket. That’s his game. But the way he came back and did it after going out … it was incredible. The way it unfolded, man, it was like a movie. You’re about to win the Super Bowl, so you’re happy for yourself and you’re happy for all your teammates. But just because of everything Doug had to deal with, all that pressure he had on him in San Diego, you had to feel really good for him. After hurting his knee, he just came back and threw the ball around all over the place. Nobody ever threw the ball better in a big game like that. Obviously, that was the second straight [Super Bowl] that was very disappointing for us, but Doug played a great game. If someone else had to win it, you’d like to see a guy like him win because of how hard he worked. Tight end Clint Didier celebrates an eight-yard reception during second quarter of Super Bowl XXII against the Denver Broncos at Jack Murphy Stadium in San Diego, Calif. The Redskins won 42-10. [Denver Broncos defensive coordinator] Joe Collier was a really good coach. For the Redskins to have that type of quarter against a guy like Joe, they had to be operating at a really high level. And that’s the thing. As you watched it, Doug Williams jumped out at you. He did play at such a high level. I was impressed with all the media attention of the first African-American quarterback to start in the Super Bowl, and what it could mean depending on how he [played]. And although I hated losing the game, once the dust settled, I was proud of his accomplishment. I was proud of the fact that he went out and made a statement. The way things are now, it’s easy to forget that teams in those days were reluctant to put African-Americans in the quarterback position. But he showed that not only could African-American quarterbacks play, they could win championships. Doug proved that. The part I still enjoy more than anything, the part that really means the most to me about what we did that day, is how much it means to black men who are older than me. When those men, who saw so many things and went through so many things, walk up to me as often as they do and say, ‘Boy, you just don’t understand what you did,’ it reminds you that after that day, a whole lot changed. Doug Williams: Retired after 1989 season. Super Bowl winner. Washington Redskins senior vice president of player personnel. Joe Gibbs: Three-time Super Bowl winner; member, Pro Football Hall of Fame. Owner, Joe Gibbs Racing. Darrell Green: Retired after 2002 season. Two-time Super Bowl winner; member, Pro Football Hall of Fame. Entrepreneur, community leader. John Elway: Retired after 1998 season. Three-time Super Bowl winner (twice as player, once as executive); member, Pro Football Hall of Fame. Denver Broncos vice president of football operations/general manager. Mike Shanahan: Three-time Super Bowl winner (twice as head coach, once as high-ranking assistant). Retired. Jeff Bostic: Retired after 1993 season. Three-time Super Bowl winner. Real estate developer. Ricky Sanders: Retired after 1995 season. Two-time Super Bowl winner. Clint Didier: Retired after 1989 season. Two-time Super Bowl winner. Farmer, moving business. Timmy Smith: Retired after 1990 season. Super Bowl winner. Works in oil business. Simon Fletcher: Retired after 1995 season. Construction developer, restaurateur.